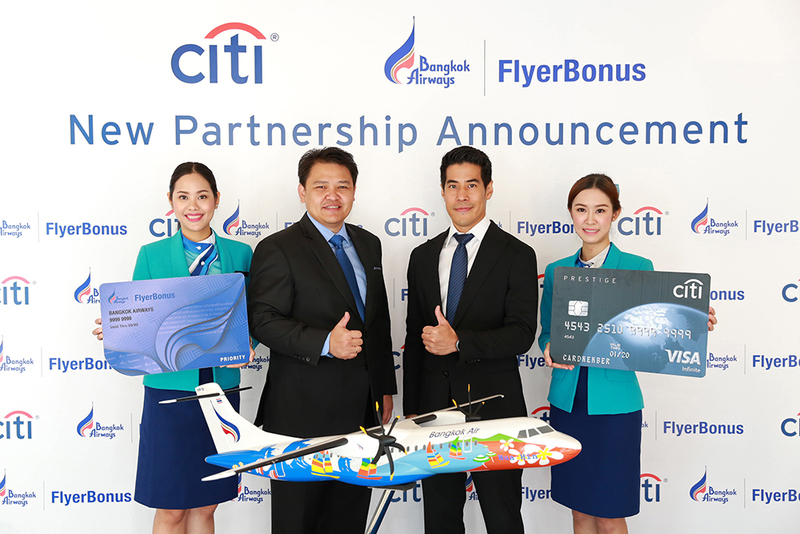 Bangkok, 23 July 2018 - Bangkok Airways and Citi are joining hands to offer Citi Credit Card holders with an array of privileges and reward opportunities via the Boutique Airline’s Frequent Flyer Programme, FlyerBonus. With the roll-out of a new partnership on 22 July, 2018, Citi and Bangkok Airways, would like to invite Citi Credit Card holders to experience the award-winning airline's spectacular destinations, onboard service and vast array of reward opportunities. Citi Credit Card holders with exquisite lifestyle can now travel faster with the transfer of Citi Rewards points to FlyerBonus points. Redeem awards for flights on Bangkok Airways and Partner Airlines, Hotel stays, Car Rentals and Lifestyle Awards. In addition, during the partnership introduction period from 22 July – 30 September 2018, Citi Credit Card holders transferring Citi Rewards points to FlyerBonus points will receive additional 20% bonus points. Don't Miss! Top 3 redeemers, can receive 3-Days 2-Nights Hotel Vouchers at Dusit Thani Maldives value 100,000 Baht, Dusit Thani Krabi Beach Resort value 15,600 Baht and DusitPrincess Moonrise Beach Resort Phu Quoc Vietnam value 13,000 Baht. Simply contact Citi ThankYouSM Rewards (Thailand's Credit Card leader in Airline Redemption) at www.citibank.co.th/thankyouen and select 'Bangkok Airways' Menu to start the ball rolling!